I’m very skillful. 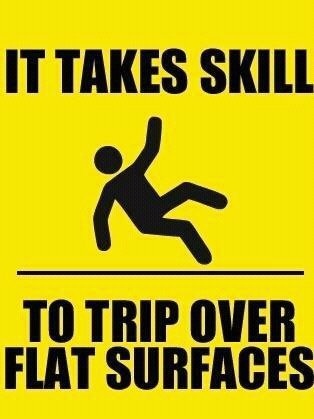 I’m the only person I know who, when standing still, can fall over, just have an ankle bend and SMACK!! I’m on the floor. It happened twice in the last four days. Ended up with a swollen ankle and a big bruise on my bum where I landed. What’s really strange is that I’ve never once fallen when doing things that are actualy dangerous. In these same four days I’ve climbed on three different step ladders, a couple of counters, one tall dresser, and stood on the bed to hang posters, without injuring myself once (unless you count dropping a string of fairy lights on my head). Maybe I should spend more of my life on ladders. Because I can injure myself doing normal things, ya know. Yesterday I was unplugging my space heater from the extension cord, when it gave off a bunch of sparks, and scorched my hand. The area around my right ring finger & pinkie were black, and had a tiny blister; the black stuff washed off, and the blister is gone today, but man did that hurt! (I got rid of the extension cord–it was old, and apparently dangerous! ).